The Health and Care Professions Council wants to raise its registration fee by an inflation-busting 18%. UNISON wants to stop this unfair charge on health staff. We surveyed our members who are registered with the HCPC about the proposals and an overwhelming 99% said they did not agree with the rise. What’s more, three-quarters of those who replied said the HCPC does not provide value for money with the current fee, let alone the proposed higher fee. It is also completely disproportionate to wage increases in the NHS. They also regulate social workers in England. Health professionals regulated by the HCPC must pay this yearly fee before they are allowed to practise. If the proposed fee rise happens, HCPC fees will have risen by 40 per cent since 2014. The HCPC set out its proposals for the fees rise in a consultation document at the end of 2018. We submitted a response that included the voices of our members who said they cannot afford any more increases in fees. Wages in the health service have effectively been cut over the last 10 years and so it is shocking that the HCPC can raise fees without considering the impact this will have on registrants. Alongside other unions and professional organisations, we wrote an open letter to the HCPC in December to argue against the fee increase. We are continuing to lobby the HCPC and also politicians to make sure they realise how damaging this rise will be to the pockets and the trust of health staff. Our consultation response to the HCPC suggested the HCPC to do more to reduce the cost of unnecessary investigations against registrants and to improve how it handles fitness to practise cases in order to reduce costs. We are briefing MPs and writing to the HCPC council members to ask them to consider these cost-cutting measures. Read the letter sent by 47 MPs and peers urging HCPC not to impose the increase. We believe that the HCPC will lose the trust of registrants if this fee increase goes ahead despite overwhelming objections from those that it regulates. In spite of overwhelming opposition the HCPC has decided to proceed with its 18% hike in fees for paramedics, occupational therapists, radiographers and others that it regulates. UNISON is hugely disappointed but our campaign is not over. Help stop the HCPC fees hike: write to your MP and ask them to sign Early Day Motion 2069 that calls on the HCPC to think again. 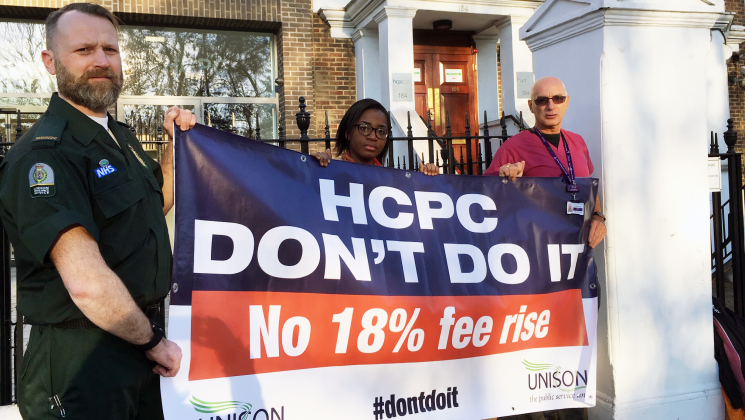 UNISON is campaigning to stop the HCPC hiking fees for health staff by an inflation-busting 18%.